We have a new batch of enamel pins and shirts available for the next 8 days! 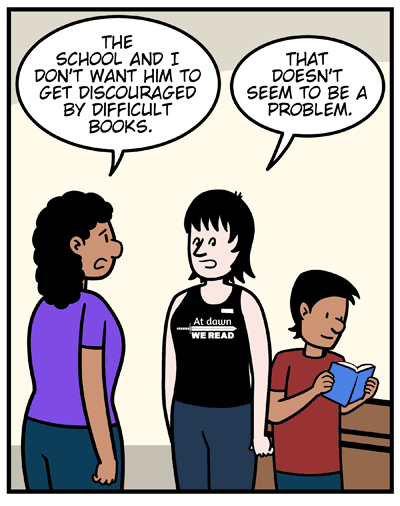 Patron: The school and I don’t want him to get discouraged by difficult books. Jane: That doesn’t seem to be a problem. Patron: Just because we got lucky this time doesn’t mean he’ll enjoy the next book he picks up. Jane: Well, we’re here to help. And we support your right to try to control your son’s reading. Jane: Frankly, it’s a losing battle. 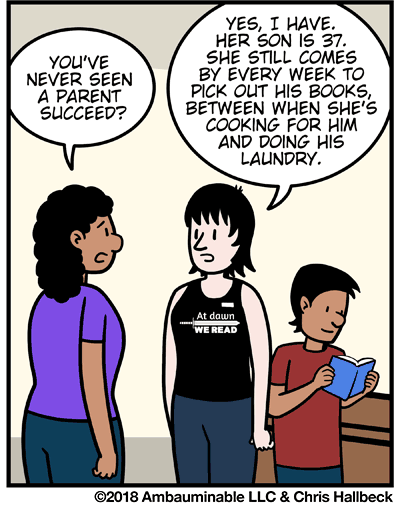 Patron: You’ve never seen a parent succeed? Jane: Yes, I have. Her son is 37. She still comes by every week to pick out his books, between when she’s cooking for him and doing his laundry.